We update our website by Tuesday evening of each sale week. We don’t have a sale this week! Sign up for our notifications so you don’t miss our next big stash of treasure! Click here for a better way to view the photos (thumbnails). We are notorious for opening early - by as much as 20 minutes. We allow written offers on any item. For a better response time, don’t email questions. Please call or text instead. We are at a sale house and not in front of a computer, so we don’t see emails ’til WAY later. We’d love to have a better chance to help you! Very nice antique 9-foot rosewood pro-style billard table by Balke-Collender Co. (professional movers have already been hired - call John: 501-607-4747), coffee table with barley-twist legs, framed art and home decor - several boat/sailing themed items, mirrors, lamps, area rugs and runners, silk plants, stereo components & speakers, books, CDs, bookcases, glass-top hall table, side tables and chairs, leather nail-head recliner, desk, home office supplies, computer equipment and components, graphing calculators, cards & games, small Bombay-style chest, beautiful dining table, 8 parson’s chairs, very nice buffet, china - Mikasa and Lenox, crystal - including Waterford, antique needlepoint chair, gorgeous flip-top table, apothecary chest, rustic round kitchen table & 4 chairs, sideboard with wine rack; nice kitchenware - everyday dishes, fun serving pieces, small amount of Spode Christmas Tree, glass/barware, cooking, baking, storage, small appliances, knives and more; bar chairs, bar stools, nice hall tree with mirrors high and low, king-sized bed with tall headboard, king-size “brass” bed, queen-size sleigh bed and mattress set, queen-size 4-poster canopy bed, dresser with mirror and matching night stands, tall chest of drawers, industrial carpet cleaner/steamer/vac with attachments, side tables and chairs, ladies’ fur jacket, linens, toiletries and first-aid, cosmetics and beauty supplies, men’s and women’s clothing and shoes, luggage, basic round table with leaf, leather sectional sofa, round glass-top coffee table, home gym equipment - Bio Force “weight” machine, NordicTrack treadmill, Precor elliptical, Vision Fitness recumbent bike, Christmas decor, lateral file cabinet, basic chest of drawers, small antique rocker with needlepoint seat, small vanity mirror, wing-back recliner; FULL garage - air compressor, drill press, lawn mower, gas cans and portable tanks, wheelbarrow, ladders, coolers, yard tools, extension cords, paint, cleaning supplies, shop vac, portable a/c, weed eater, electric hedge trimmer, stroller, baker’s rack style plant stand, fridge, large car jack, propane tanks, hand tools, Craftsman rolling tool chest, propane burner and large pot, scuba gear, electric nail gun, grinder, propane grill, round patio table, patio armchairs and side table, outdoor lounge chairs, oversized pots/planters and more!! A little on the narrow side and we’re dealing with mailboxes, of course. Please park on one side only and help us be kind to the neighbors, as usual. Thanks!! Oh, and you can go up and make the block to get out instead of turning around. We are in West Little Rock off of Pebble Beach Dr. in the section that runs between Hinson and Rahling Rd…. our street is actually 2 blocks east of the round-about at Rahling Rd., so you will encounter far fewer speed humps and stop signs if you come from that direction. Drive south on Taylor Loop so that you are driving away from Walgreens. At the traffic lights continue straight and when you reach the round-about, take the second exit and you will be on Pebble Beach Dr. Levant is the second street on your left. We are up Levant a little ways on your left. Drive away from the Promenade Shopping Mall and the Movie Theater on Rahling Rd. so that you are passing a wooded area on your left. Continue on Rahling to the round-about and take your first exit so that you are on Pebble Beach Dr. Levant is the second street on your left. We are up Levant a little ways on your left. Wondering when we could do a sale for you? Call us & set up that initial walk-through! Sooner is always better to get the information you need. Pennsylvania Trading Co. loves The Van and all of their volunteers!! If you haven't heard about them & what they do, click the yellow logo above & discover the best homeless outreach ever. Available in any amount at our sales, or contact Emily to purchase over the phone! Visit Ashley’s Finds to find out about other estate sales & auctions this week! Never been to an estate sale before? They’re a great way to find the things you were already going to buy at prices well below retail. Don’t miss out on the deals! 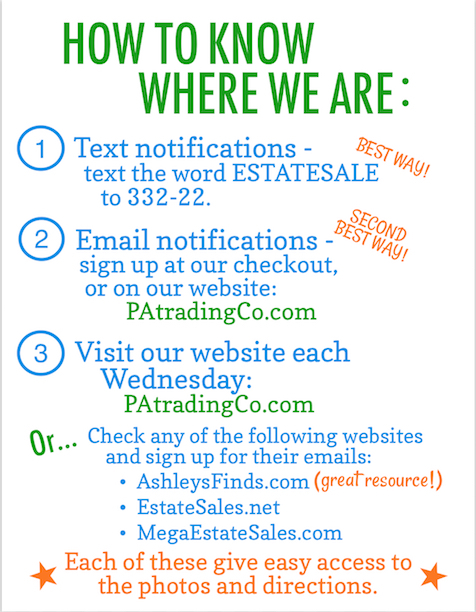 Find out more about estate sales here. Think you might need the help of an estate sale service? Click here to read more about what we do & how to find out if an estate sale would be right for you. Curious about what people have to say about Pennsylvania Trading Co.? We ask often & we'd love to share what they have to say!